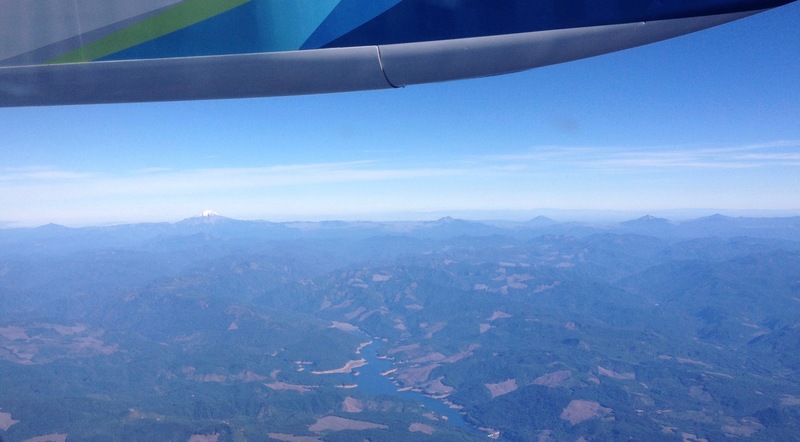 SFO to PDX: View from the Window Seat – Tour Guide Mark – Let's Go Exploring! Explorations can sometimes be found at 38,000 feet while sitting in the cramped quarters of an airplane. The route between San Francisco, California and the Pacific Northwest is a favorite to visually explore because of the varied topography. Here are some photos, the images were taken over several trips. A magnificent view of San Francisco and the Golden Gate. San Francisco covers an area roughly 49 square miles! The Golden Gate Bridge shown on the left is 1.7 miles in length and 746′ tall. Mount Shasta (14,179′). Shasta sits uniquely at the southern end of the Cascade Range and the northern end of the Sacramento Valley. The mountain is so massive that it can be seen from 280 miles away from atop Diablo Mountain (3,848′), the tallest mountain in the eastern San Francisco Bay Area. Crater Lake is in the distance. 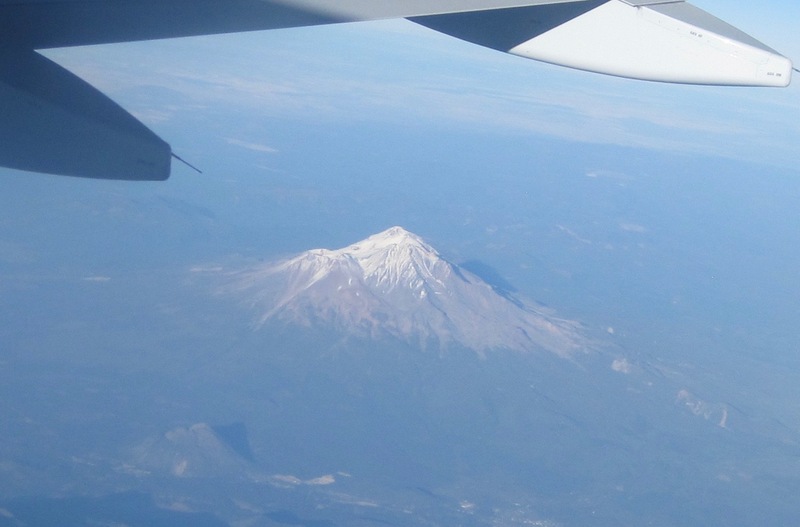 Once known as Mount Mazama, this peak rivaled Mount Shasta for prominence upon the skyline. 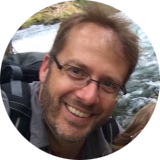 Mazama erupted about 7,000 years ago, and in the process list its peak and collapsed upon itself. Over time the remaining crater filled with water. The lake is 2,000′ deep and about 5 miles across. From north to south – left to right: Black Butte (6,436′) Mount Washington, Belknap Crater (6,876′), and the Three Sisters (north, middle and the south sisters); they were once known as Faith, Hope, and Charity. From north to south – left to right: Ollalie Butte (7,219′), the snow-capped Mount Jefferson (10,497′), Three Fingered Jack (7,844′), Black Butte, Mount Washington, and Belknap Crater. 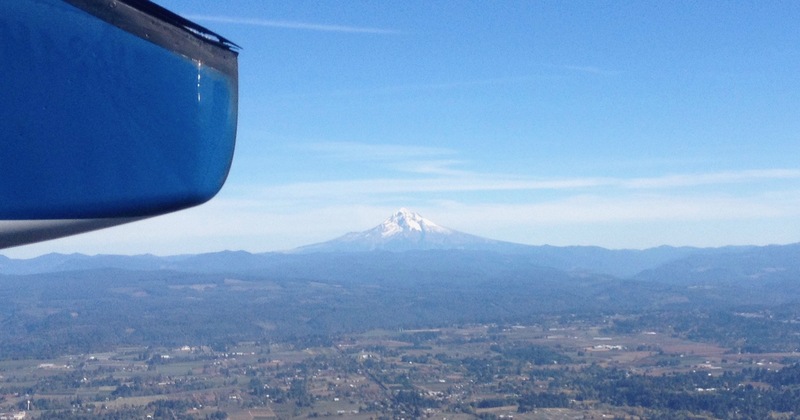 Mount Hood (11,250′) dominates the skyline east of Portland, Oregon. Looking north into Washington State to Mount St. Helens (8,366′), Mount Rainier (14,411′), and Mount Adams (12,280′). The mighty Columbia River is in the foreground.